The BMO Harris Bank Platinum Rewards Mastercard currently has an Informr score of 7.2 out of 10. This score is based on our evaluation of 1 sources including reviews from users and the web's most trusted critics. 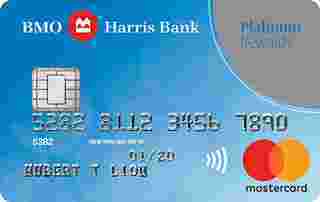 BMO Harris Bank Platinum Rewards Mastercard is typically available to those with excellent credit scores (650 or greater). If you’re a casual traveler looking to turn points earned on everyday gas and grocery spending into a free flight or hotel night, you probably won’t notice (or care about) the BMO Harris Bank Platinum Rewards Mastercard‘s drawbacks. After all, with no annual fee, there’s little downside to keeping this card in your wallet, even if you use it infrequently or in spurts.